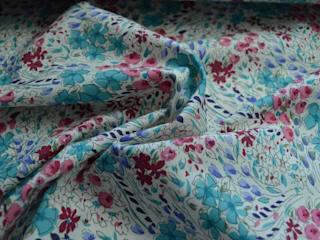 Pima Cotton Fabrics - Perfect for Spring. order fabric suppliers long before the age of the internet. In the eighties Croft Mill supplied thousands of people a month with fabrics direct to their door. 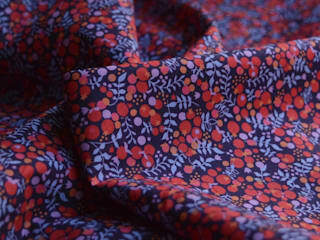 Croft Mill UK comprises all the good old names of mail order fabrics. J. W Coates, Bradley Textiles and of course Croft Mill itself. We go way back to when a good night out cost less than 10 ‘bob’ and fabric remnants were sold in bundles, when there was a mill at the end of every street in our part of Lancashire and tripe and onions were part of the every day diet and not on a Michelin stared menu. Alan managed the entire vertical process of cloth manufacturing at Smith and Nephew in Lancashire weaving denim and surgical cloth before joining his brother and writing about cloth in his witty catalogue which reached 20,000 people at its peak. There was a time when everyone made their own clothes but how things have changed, as did things at Croft Mill because after 35 years Alan retired and Croft Mill mail order closed its doors in April 2008. Now it is back and it is still a family affair as daughter Caroline set up a new business of the same name which opened its virtual doors in April 2009. Being around cloth from the age of four, working at Croft Mill in the Holidays and her mum a talented seamstress this naturally inspired Caroline’s creative streak towards the study of fashion and textile design. This led to amongst other jobs, designing printed fabrics in Australia for several design houses before finally coming back to the UK to work as a fabric designer in print and weave, ending up as design manager in contract furnishing. After the birth of her first child in 2008 when her daughter was six months old the plan to revive Croft Mill came about when sadly Caroline lost her job whilst on maternity leave. With other job offers on the table, straight away she decided that the only way forward was to have her own business. It’s been a lot of hard work but it’s been wonderful to work with a brand that has such a loyal following and warmth and has made a lot of women and businesses very happy. It’s a pleasure to work with fabrics everyday, we love fabric, not just the pretty prints but put simply just beautiful cloth. Our team of five full and part time staff, including Alan (who just tinkers to be honest), have a lot of knowledge in cloth, fabrics, textiles, whichever the preferred term. Our aim remains the same; to continue to give you a friendly and honest service, supplying you with interesting and beautiful fabrics.